Guitar three was my first ”real” guitar – in 1985 I sold my alto saxophone (sorry, mom and dad!) and bought a black Ibanez Roadstar II series RS430 (pic to the right lifted from the catalog). It had three single coil pickups (I later replaced the bridge p/u for a Mighty Mite humbucker that squealed something fierce!) and a locking tremolo. The guitar was fairly quickly replaced by a purple/pink (yes, those were the days! Check out the guitar on the ”Twitch” by Aldo Nova album cover – that’s the colour) ESP parts-o-caster strat with two humbuckers, which I later fit an Ibanez Edge locking tremolo to and repainted in a friend’s garage. The former mod was a good move, while the latter… well, let’s not go there. Anyway, back to the history. Inexplicably – at least in hindsight – I sold the Kramer and bought an Ibanez ProLine PL2550. It had IBZ HSS pickups, and a funky preset pickup selector. The normal 5-way switch was there, along with a small row of on/off push switches which you could use to pre-set a pickup combination. One of the push switches activated the preset, so you could switch back and forth between that setting and the 5-way. As you might have guessed, the guitar didn’t last very long, though, as was the norm back then. Too bad, since it was actually a rather nice guitar – if a bit over-complicated in the pickup/switching department. I traded the Ibanez – after having destroyed the resale value by matting the paint on the back of the neck 🙂 – for a black Valley Arts M-series: 7/8 size, Gibson scale, licensed Floyd Rose with HSS Select pickups. Naturally, I couldn’t leave it alone, so I stripped the paint off the back of the neck and replaced the pickups with real EMG’s (SA/SA/85 with an SPC presence control), and played the guitar until circa 1991, when I took delivery of the Wahlberg. Which brings us up to date – I actually stopped selling guitars around that time, probably because I realized that I had let a couple of jems slip through my fingers along the way. So the ones I’ve had since then are on the ”guitars” page. 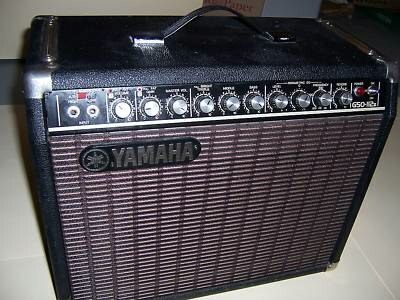 My first guitar amp was a Hagström 25w solid state affair. I still have it, actually 🙂 I used it with a no-name overdrive pedal I bought around the same time, and later (circa 1983) I bought an Ibanez Tube Screamer. A year or two later, I sold the TS-9 and bought an Ibanez UE-300 multi-fx unit and a Yamaha G50-II 1×12″ combo (picture to the right). That setup lasted a couple of years, and gave me some really good tones. I traded the Yamaha (and possibly the UE-300 as well) for a Music Man HD130 (or 410HD – don’t remember which) 4×10″ combo, which I used with a Yamaha REX50 digital effects unit. Digital distortion… oh well. At some point, I also used a Roland JC120, possibly with a Roland GP-8 (although I can’t remember if that one was mine or something I borrowed). Around 1988-early 1989, the ADA MP-1 hit Sweden, and I jumped at it. My first rack rig had the MP-1 preamp, a Digitech DSP128 multi-effect and a LEM 2x70w power amp going into two Session 1×12″ cabinets. The cabs were soon replaced by two Marshall Silver Jubilee 2556A cabinets (2×12″), while the rack grew. I ditched the ADA and LEM power amp in favour of a Kitty Hawk Quattro preamp and tube power amp setup, using the Kitty Hawk midi patch bay as the basis for switching stuff in/out. Along the way, the Marshall cabs were replaced (another stupid move by me – those are really hard to find these days) with two Peavey 2×12″ cabs, which at the end were replaced by two ported 1×12″ cabs with Electro-Voice EVM12 speakers. Around 1996, I got tired of editing patches and also wanted to move away from the LA studio cat playing style a bit. I sold the majority of the rack gear and bought a 1978 Fender Twin Reverb, which I mainly played using an old Ibanez TS-9, going for some rawer tones. That amp was later replaced by a 2×10″ Mesa/Boogie Blue Angel combo, which in turn was replaced by the 1970 Fender Twin Reverb you can see on the amps page, again bringing us up to date.